The rent at Vu New River Apartments ranges from $1,945 for a one bedroom to a $3,455 two bedroom. Apartments in this building are about 13% more expensive than the Downtown average. This is a pet-friendly apartment. 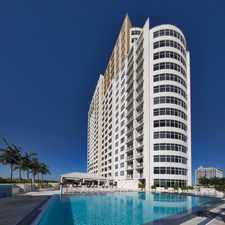 This apartment is in the Downtown neighborhood in Fort Lauderdale. Nearby parks include Bubier Park, Stranahan Park and Virginia S. Young Park. Vu New River Apartments has a Walk Score of 78 out of 100. This location is Very Walkable so most errands can be accomplished on foot. New River invites you to leave predictability behind. The opportunities for indulgence are endless, engaging and right outside your door. Imagine being so close to the pulse of Las Olas Boulevard that by stepping outside your door you become immersed in all the elements that define your urban lifestyle. The hottest trends in fashion, dining and entertainment are all within your reach. Explore how far you can travel by car, bus, bike and foot from Vu New River Apartments. Vu New River Apartments has good transit which means many nearby public transportation options. Car sharing is available from RelayRides. Search for homes in Fort Lauderdale or find a Fort Lauderdale real estate agent who knows walkable neighborhoods. Links will open on our partner site Redfin.com. Vu New River Apartments is in the Downtown neighborhood. Downtown is the most walkable neighborhood in Fort Lauderdale with a neighborhood Walk Score of 89.